Are you having a hard time perfecting pot roast? Does it come out perfect one time and tough and chewy the next? Every Sunday, my mom would make either fried chicken or a pot roast in the electric frying pan. She was the one who taught me as a young girl how to make the perfect gravy. The dark, crusty bits the roast left behind made for the BEST gravy ever. 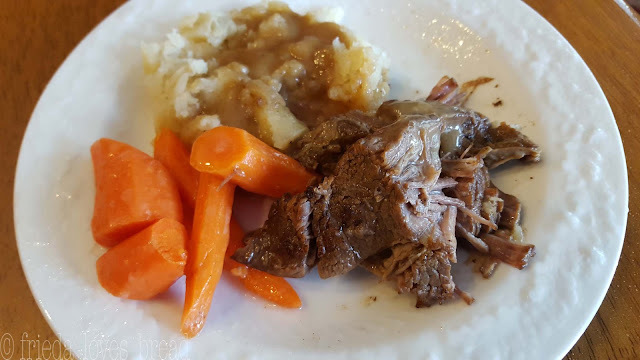 Making pot roast the traditional way in the oven takes a long time, three or four hours, depending on the size of the roast, but the payoff is a moist, tender, melt in your mouth roast. I wanted to know how I can take my mom's pot roast and make it better, easier and faster in the pressure cooker. 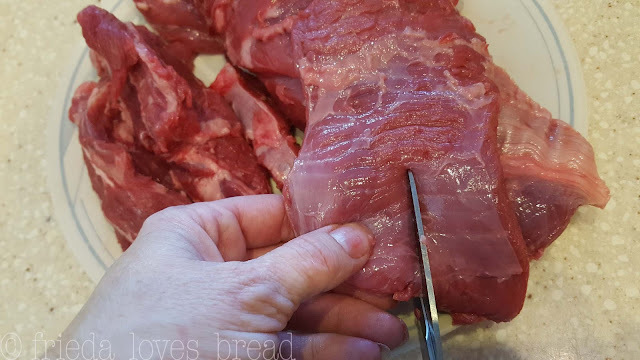 You can read through this step by step post, or follow along with me in this video - you will learn a LOT and have a fork tender roast, every single time! Enjoy! I went through several roasts, weighed them, timed them and could not get consistent results. I was baffled. I read somewhere that I should be using the thickness of the roast to determine my cooking time. Hip Pressure Cooking has great timing charts for just about everything. Her suggestion is to cook a beef roast for 75 minutes with a natural release. She doesn't mention weight or thickness. Lorna Sass, of Pressure Perfect, lists BOTH weight and thickness for a boneless chuck roast, more than 2" thick, 2.5 pounds for 35-45 minutes with a full natural release. Then America's Test Kitchen came out with their book, Pressure Cooker Perfection and in this book, they have 2 different pot roast recipes. One method takes 90 minutes, and the other recipe 30 minutes of cooking time, both with a 15 min natural release, not a full one. Really? What's the difference? The shorter cooking method cuts the cooking time by 2/3rds and has the meat already portioned into serving sizes. Genius, I tell you! ATK'S method made the most sense to me. When I cook veggies, they cook best if they are uniform in size. Why not for chuck roast? Cutting 2" slices against the grain levels the playing field so to speak and makes for a tender and moist chuck roast. 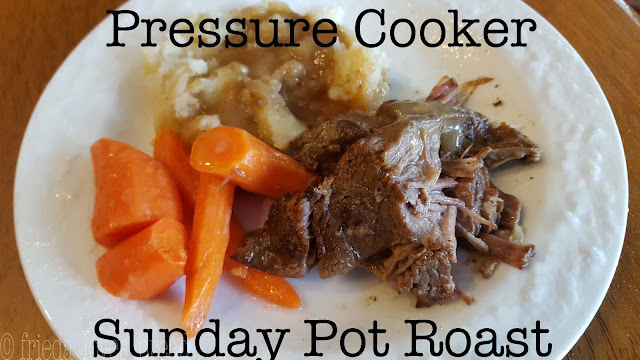 It was simple to adapt their technique to my mom's recipe, cooking a roast under pressure for 30 min! 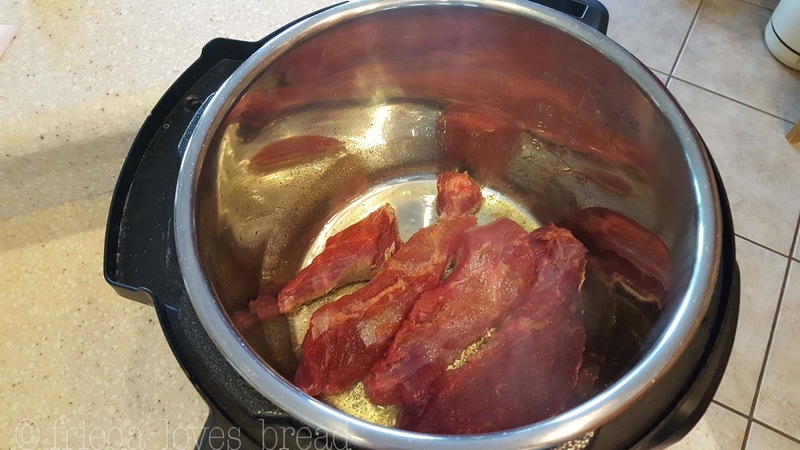 Chuck roast is the meat of choice for pressure cooking as it is not as lean and won't have a tendency to dry out as easily as other cuts. 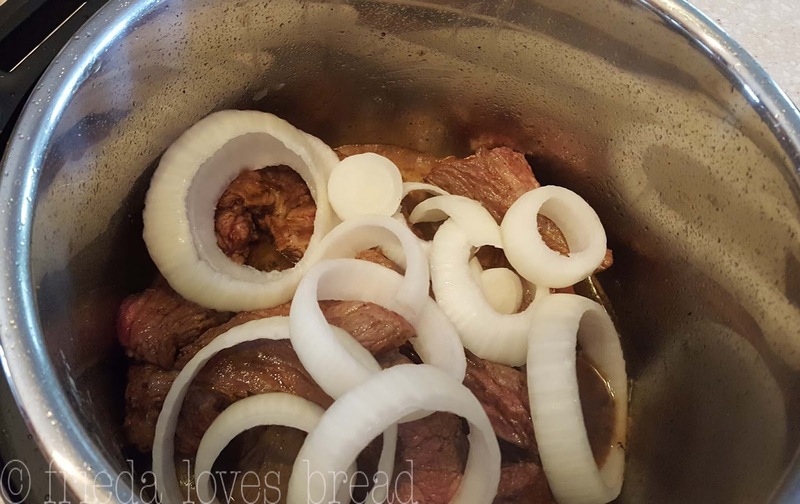 Start out with a 2.5 - 3 pound chuck roast. 1. Trim off any large sections of fat. This helps keep the gravy from being too oily. I love using kitchen shears for cutting and trimming. 2. Cut your roast against the grain into long , 2" wide strips. (Not cubes or chunks) Cut out any connective tissue you may find. 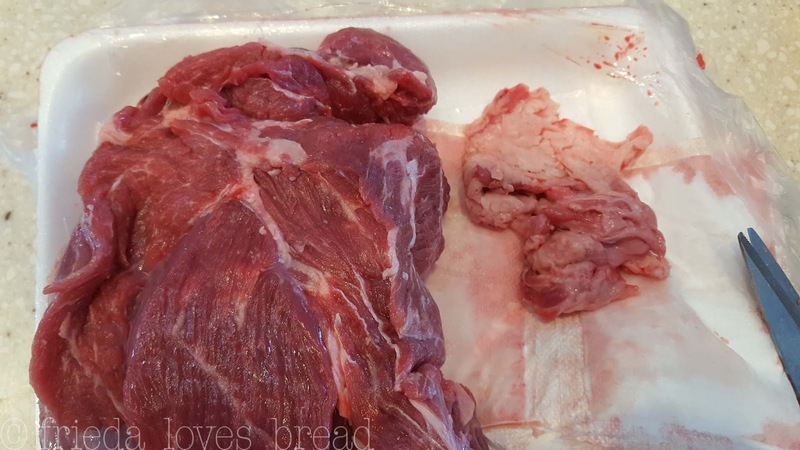 The connective tissue is the silvery membranes and what takes a longer cook time to break down in the meat. You will shave off more than half the cooking time by taking 5-10 min to trim your meat. 3. Pat your meat completely dry with paper towels to help brown your meat. 4. Season your beef strips with salt, pepper, and any spices of your choosing. My mom used Season-All. It's a great all purpose seasoning that works well with beef. 5. 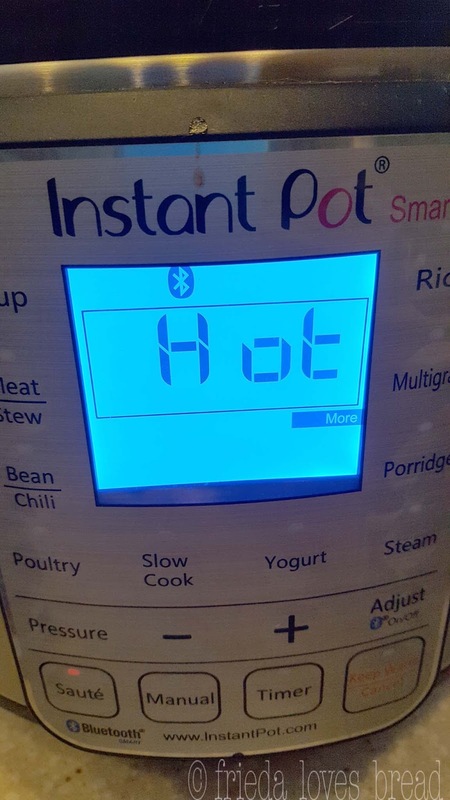 Choose the browning setting or on the Instant Pot pressure cooker, select SAUTE, then the ADJUST button once till you see MORE light up. When the display says, "HOT," put 1 Tablespoon of cooking oil into your pressure cooker. When your oil is shimmering, you are ready to brown your meat. 6. Place only a few pieces of meat into the pan. You don't want to crowd the pan with too much cold meat and reduce the cooking temp. 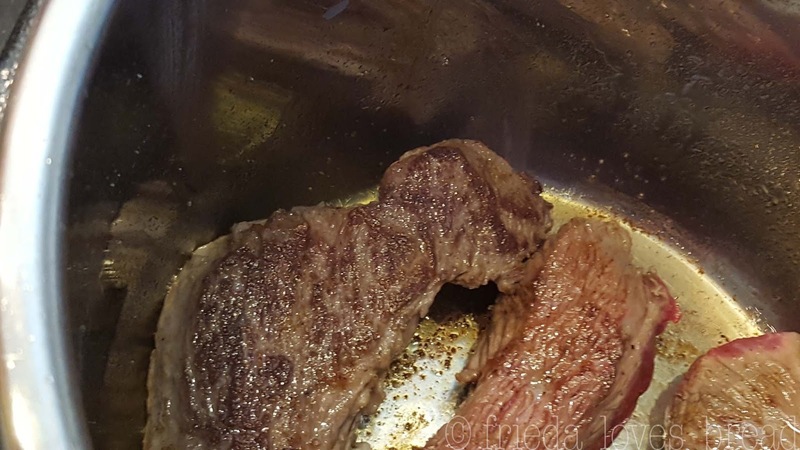 Resist the urge to flip the meat until you begin to see a dark brown sear on your meat. Brown all sides and set aside your browned meat until all the pieces have browned. See that beautiful brown color? That's flavor. You do not want to skip this step, trust me. It's worth it! 7. Turn your pressure cooker off. Pour your broth mixture carefully into your pan. What we are doing now is "deglazing" or taking off the crusty, stuck on bits on the bottom of your pan. If you do not scrape this bits (fond), your pressure cooker will think food is burning and the safety features will kick in, shut your pressure cooker down and not allow it to come to pressure. Using a flat edge spatula (wooden or metal) will help you scrape the bits off easier. I like to add onion for some additional flavor. They will pretty much disintegrate, but that's ok with us. 9. While your chuck is cooking, begin prepping your veggies. Baby carrots or regular carrots cut into 2" lengths are perfect. I am enjoying this steamer basket. It makes getting my veggies out of the pressure cooker so much easier. It comes with handles and if you bend them up or break them off, the basket will fit perfectly in your 6qt pressure cooker. 10. When your roast is done with the 15 min natural release, take the meat/onions out and put it on a plate. Cover it with foil to keep it warm. You will need to do this every time you do back-to-back cooking. You will want a good seal for cooking your veggies, as they will only need 5-6 minutes of cooking time. 11. Put your cut veggies in a steamer basket, directly into the hot broth. Close the lid, set the valve to sealing, and select HIGH pressure for 5-6 minutes with a quick release of pressure when the cooking is done. Open the lid and remove the strainer basket of veggies. Cover and set aside. 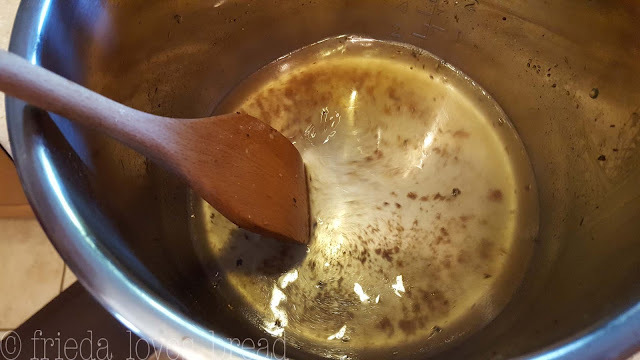 If you want to make gravy, it will only take an extra 10 minutes of time. Ready? Let's do it! 12. 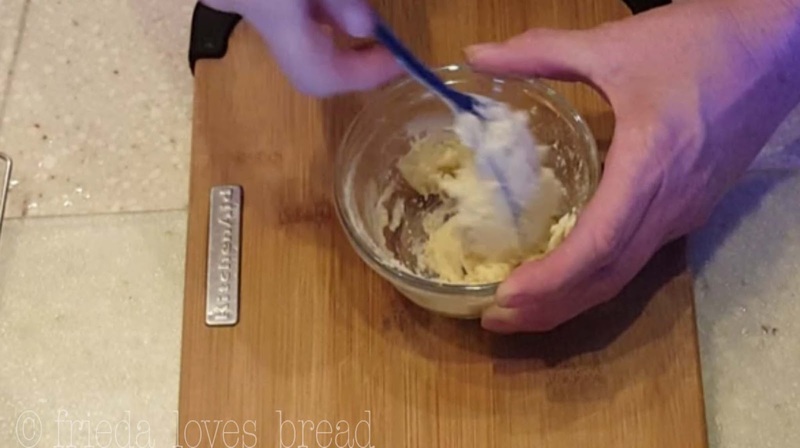 Mix equal parts all purpose flour and softened butter, till it forms a thick paste. Drop this into the meat broth and quickly whisk it smooth. I love the richness butter gives gravy since I'm not using the traditional method of making it with the browned bits or in the pan. 13. Turn the pressure cooker to browning or SAUTE MORE mode. 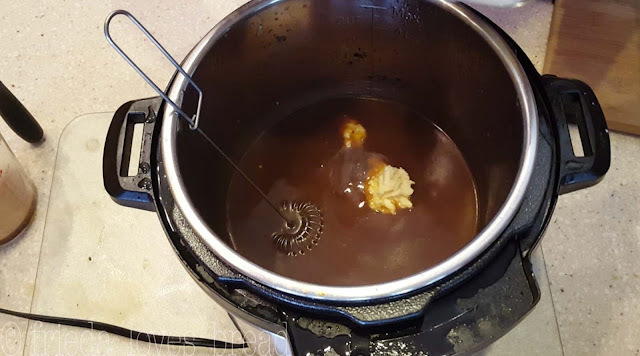 Stir or use a whisk continuously (so the gravy won't burn on the bottom of the pan) till the gravy begins to bubble and thicken to your desired consistency. I hope you will use these tips and techniques to perfect your favorite family roast recipe in your pressure cooker. Thanks, mom. I love you! Chuck is the preferred meat to use when pressure cooking. Follow these tips & techniques for a fork tender roast, perfectly cooked veggies and a silky smooth gravy. The secret to full flavor and short cook time is trimming the meat and browning it first. These techniques can be adapted to any roast recipe. 1. Put 1 Tablespoon cooking oil in pressure cooker. Select BROWNING or SAUTE (high). When pot is HOT, brown prepared meat in small batches in a single layer on all sides for 1-2 minutes.2. Remove meat from pressure cooker and turn it off. 3. 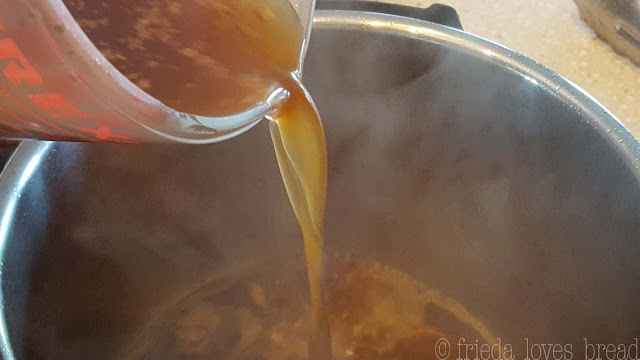 In a large measuring cup, mix together water (broth) beef bouillon, and Worcestershire sauce. Slowly pour liquid mixture into the pot, scraping all the browned bits off the bottom of the pot. 4. Put browned meat back into the pot. Top with onions and bay leaves.5. Put lid on pressure cooker, close the pressure valve and select HIGH pressure for 30 minutes.6. When cook time ends, allow the pressure to naturally release for 15 minutes. After 15 minutes, open the pressure valve to release any remaining pressure. 7. Remove roast, put on a plate and cover with foil. 8. 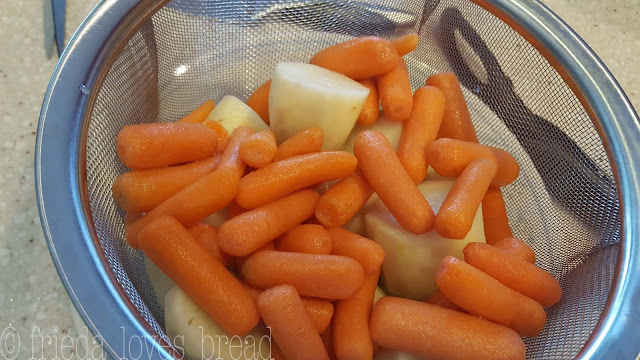 Using a steamer basket/trivet, put cut potatoes and carrots into the broth. 9. Close pressure cooker, close pressure valve, select HIGH pressure for 5-6 minutes. At the end of cook time, open the pressure valve for a quick release. Remove veggies and put onto a plate. Cover. 10. Mash softened butter and flour to form a paste. Select Saute/Browning on the pressure cooker and quickly whisk in flour mixture into the broth, stirring constantly until thickened to desired consistency.